Line input only version of the Micro 25 pre amplifier. If you need a phono stage, see the Micro 25 pre amplifier. Croft Acoustics Micro 25 Line Pre Amplifier aims to provide best value with only the essentials and no need for frills. There is a simple circuit that makes up this pre-amplifier yet the music has areas of openess and authority that heavily modified and more complex units struggle to reveal in quite the same manner. A true bargain. The Micro 25 Pre-Amplifier employs clever Synchronised Switch Damping over the usual cathode follower valve with the Mosfet not being employed directly in the signal path. Separate volume controls for left and right channels, Selector switch for phono and three line inputs and a mute switch are on the front panel, along with a power indicator light and on/off switch. 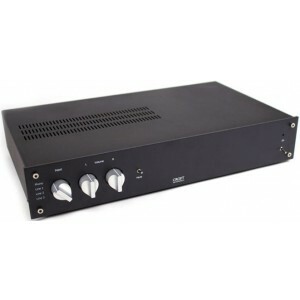 This pre-amplifier is designed to work with Croft Acoustics Power Amplifiers, both pre and powers are phase-inverting.